Buckley Smith design T SHIRTS $30! 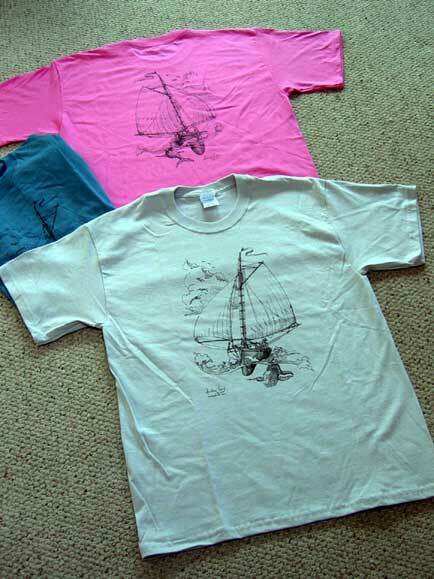 The current colors for the short sleeve front and back whale and boat design are orange, yellow, violet, turquoise, blue, pink, gray…and more! 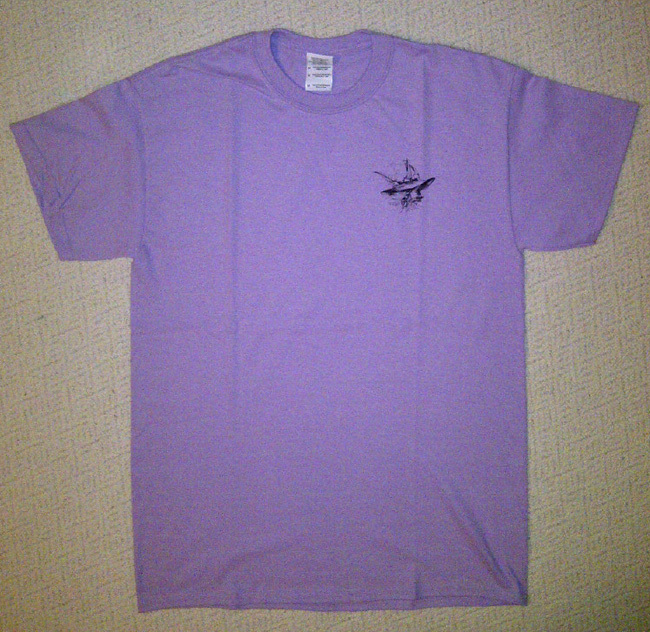 We have one long sleeve version in an elegant sand color, too. 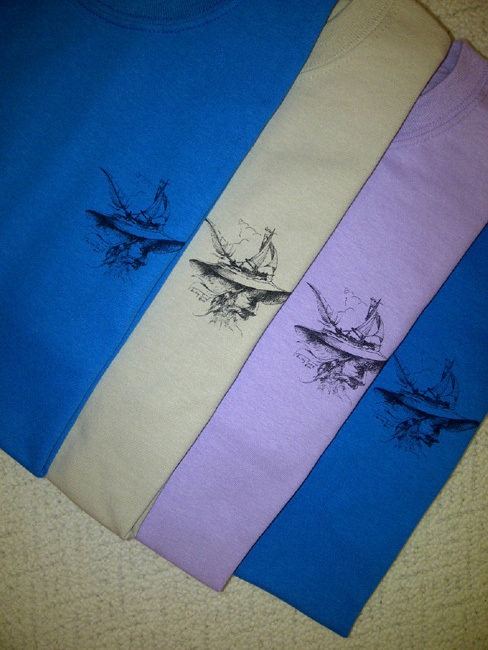 For the long sleeve with white flying boat design: Navy. 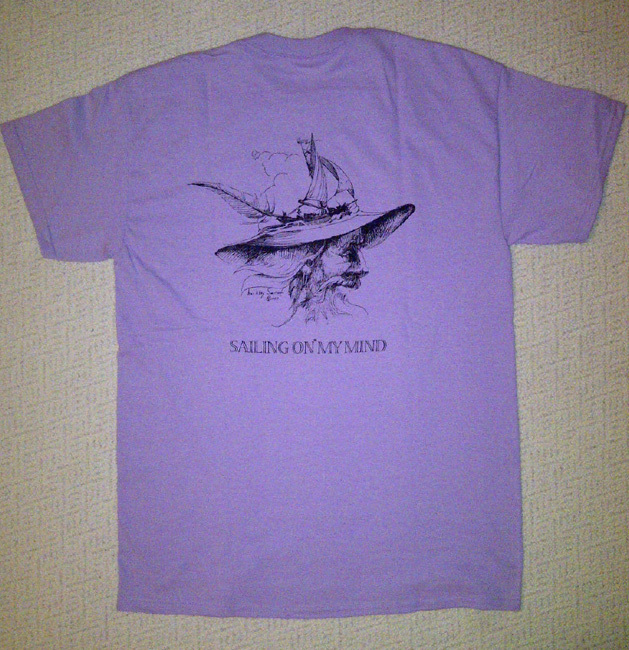 Adult sizes for all shirts: M, L, XL. Order direct from sherb2@juno.com!! Buckley Smith can design your event T shirt. Here’s an example. $800. An extraordinary pictorial fantasy without words. $20.00 Can be purchased directly from Buckley. 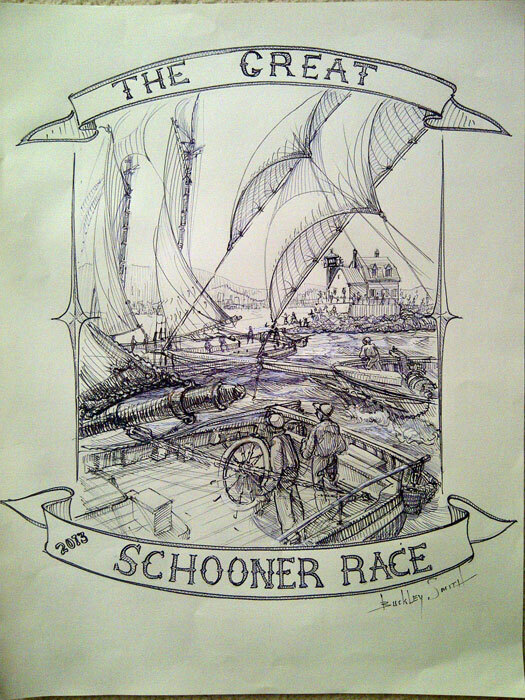 Sailing (and Drawing) Around the Moon Reading about Buckley Smith’s life at his website www.buckleysmith.com, one comes away with the distinct impression of the quintessential free spirit. 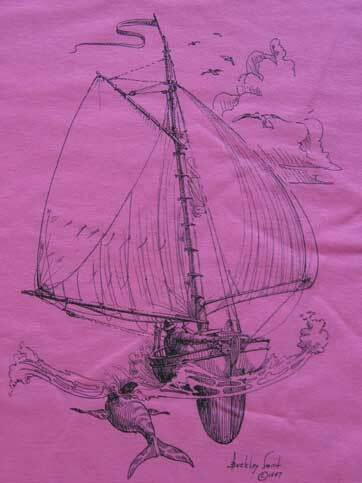 Born in southern California in 1947, from an early age Smith cultivated twin passions, sailing and art. 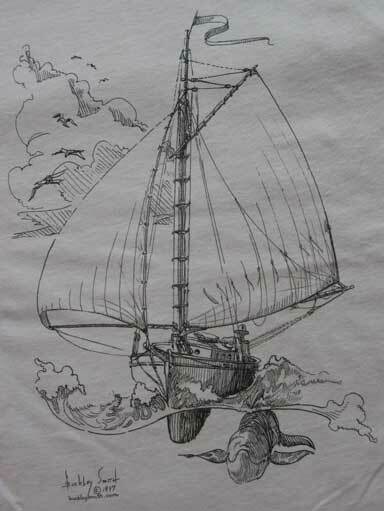 When he wasn’t building boats or sailing them along the coast of Maine and around the world, he was rendering them in pen and ink, graphite and charcoal. 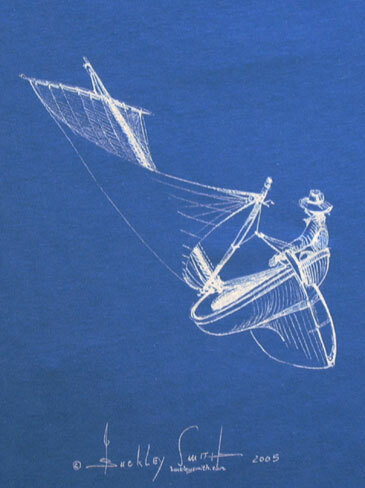 In some ways, his life and art are one: Smith is that sailor that appears in so many drawings, shown with hand on the tiller, steering his boat across the seas. And into the air: in his illustrated book, Moonsailors, Smith imagines a father and son maneuvering their gaff-rigged vessel into the night sky, letting out a fishing net across the stars as they circle the moon. Like the Polar Express making its way to the North Pole, this voyage carries us away from the limitations of Earth, with enough reality in the fantasy to help us make the leap into this dreamscape. The poet Coleridge wrote of the “willing suspension of disbelief” that certain literature requires. He also composed “The Rime of the Ancient Mariner” and the opium-induced “Kubla Khan.” These classic poems may come to mind as one opens Smith’s book to find an elderly bearded figure with pipe smoke circling his sleepy visage. That smoky penumbra appears to inspire the visions that follow. Smith’s illustrations hark back to earlier children’s books, including the wonderful fairy and goblin stories that starred sharp-nosed imps in curious hats. His materials also conjure other ages. He frequently draws on colored paper, a mainstay of the old masters, heightening the charcoal or graphite with chalk. Aside from a foreword about the artist, Moonsailors contains no text, and it doesn’t need one. One can envision sharing this book with a young person, encouraging him or her to create the narrative as the pages are turned and the next fantastic scene is revealed. A native of southern California, Smith has longtime ties to Maine, having lived for many years on an island in Penobscot Bay. He has participated in the Sweet Chariot Music Festival on Swans Island as its art director and set designer. His website also highlights his availability as an artist in residence, a muralist and “marine locator and fabricator” for film work (he provided prop boats for the movie The Cider House Rules). 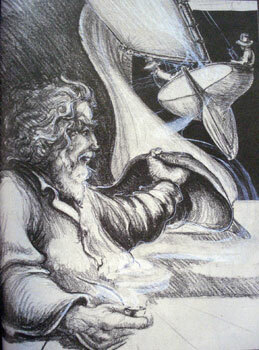 Smith also illustrated Peter Spectre’s The Expectant Father’s Cradle Boat Book (WoodenBoat Publications, 1990). 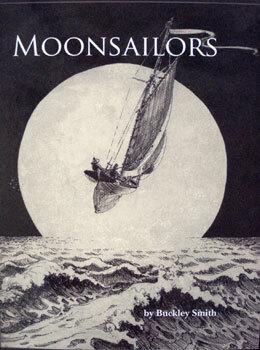 Moonsailors itself is a reprint: Green Tiger Press, a former imprint of Simon & Schuster, originally published the book (as Moon Sailors) in paperback in 1985. It’s great to have it available again — a keeper for all ages. From Journey of Trust, a book of poetry by Miranda Amapola and Buckley Smith. Buckley created Mr. Moon for the Sweet Chariot Music Festival in the summer of 1998. Hung outside the performance hall and backlit, his mellow smile welcomed the audience. It’s a full moon every night with Mr. Moon.